What kind of battery (specs) is suitable for my car? Every make and model of a car has its own battery requirement. The requirement is based on physical dimension of the car battery tray as well as the AH (or Reserve Capacity) and CCA required. You can find out exact requirements of your car either by inspecting the existing car battery or in the owner’s manual. As car battery specialists, FastFix will be able to advise the exact battery requirements if you tell us the make/model (and year) of your car. What is AH (Amp-Hours or Reserve Capacity Rating)? What is CCA (Cold Cranking Ampere)? Cold Cranking Amps is the amount of power, in Amps, that the car’s battery is able to supply in order to start the car’s engine. The technical definition of CCA is the maximum amount of Amps that a battery is capable of delivering at an ambient temperature of zero degree Fahrenheit for 30 seconds before the battery is no longer able to supply a usable amount of power. When you start your car, the battery has to supply enough power to the starter to run the motor over with enough speed to start. It must also supply enough power to the ignition system to provide a hot enough spark to make the engine start. Additionally, with newer cars, you will have fuel pumps, injector systems, computers and dash instruments which will all pull power while starting. If your battery is not capable of supplying a large enough current punch when starting, it won’t start the car. 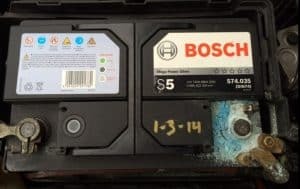 Car batteries are designed to supply anywhere from 400 cold cranking amps on the smaller batteries all the way up to over 1,500 for some of the larger and more expensive batteries. How Do I Know If My Battery is Good or Bad? You will need to conduct a car battery test using either a special battery meter (or a multimeter). A fully 100% charged battery should register 12.66V or higher on your voltmeter. 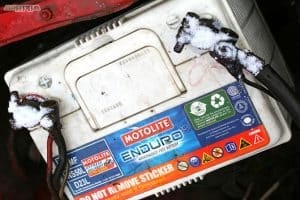 If the voltmeter reading is below 12V, your battery is no longer good and it would be wise to replace your car battery. If the reading is <11V, your car battery is about to die and you should change your car battery right away. What is the Acceptable Voltage Output from my Alternator (Charging System)? 13.8 to 14.5V or more while idling. If your alternator gives a output reading of less than 13.8V, it is considered weak and may not be able to properly charge your car battery. This may result in the dreaded “car can’t start” situation and you should visit your car workshop as soon as possible to service/replace your alternator. If you replace your car battery with FastFix, we will test your alternator and will advise you if servicing/replacement is recommended. We know of workshops who specialize in alternators and can provide recommendations – available on request. What are Maintenance Free Batteries? These are new generation of car battery designed so that they do not require any special maintenance by owners. Unlike older batteries, there is no need to top these up with distilled water. These batteries are also sometimes known as VRLA (valve regulated lead-acid), sealed batteries and sometimes “dry cell”. FastFix supplies only maintenance-free car batteries. EFB batteries are an enhanced version of standard wet-flooded technology. They are designed to meet the latest OEM vehicle demands and factory fitted into vehicles with Start Stop systems. The primary benefits of EFB technology are improved charge acceptance and greater cyclic durability when operating in a reduced state of charge (typical of Stop Start applications). As an approximation, EFB batteries will provide 85,000 engine starts, compared to 30,000 starts from standard flooded product. 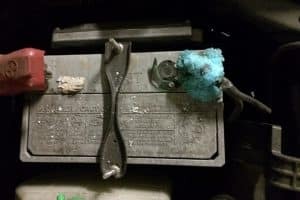 —– “Corroded terminal” is common amongst all car battery brands. This is caused by leakage of the electrolyte (sulphuric acid) out of the battery due to leaks or joints over time (years). Unfortunately no brand is immune to this. You can easily clean this DIY using steps outlined above. 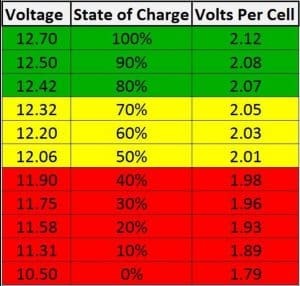 Car batteries are not designed for deep cycle discharge and their voltage should ideally be maintained in the “Green Zone” in chart here. They should never be allowed to go to “Red Zone” (ie. 11.9v and below) because the lifespan of the battery will be severely shortened.